In our pilot study at the Institute for Human Centered Design (IHCD), we used eye-tracking technology to understand how people respond to the built environment. Thirty-three test volunteers, aged 18 to 80, viewed more than 60 images of elevations and interiors using an eye-tracking system. Results showed that people are drawn to other people (even statues or images of people), areas of sharp contrast (such as street lights), and text. An overview of the study is summarized in the poster below and enlargements of the poster, provided for readability, follow. 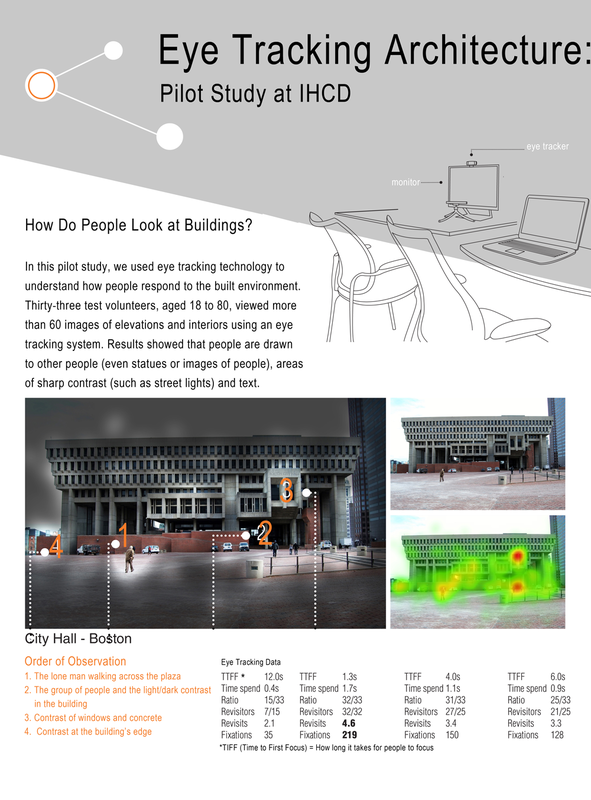 Section 1 introduces the pilot study and shows results from eye tracking Boston City Hall. 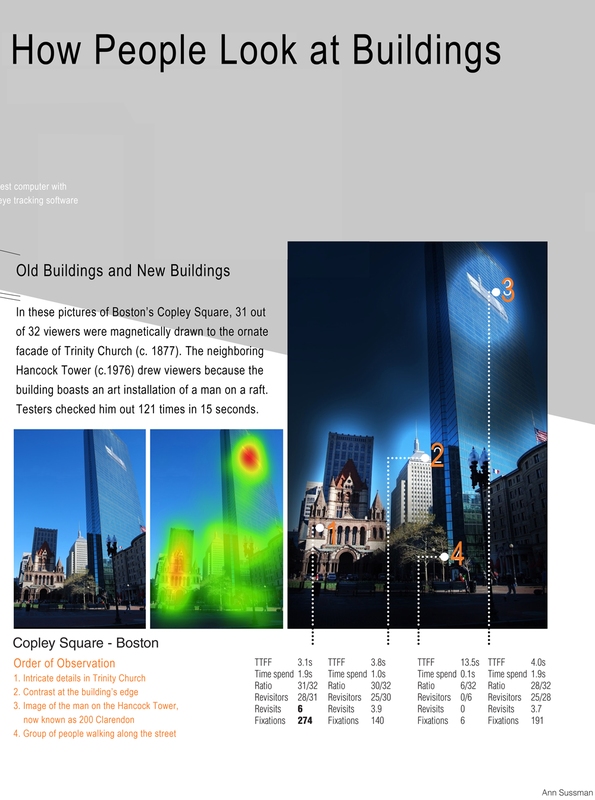 Section 2 shows results from eye tracking Boston’s Copley Square. Section 3 shows results from eye tracking an interior space. This entry was posted in Architecture, City Planning, Design, People-centric Design and tagged Eye Tracking. Bookmark the permalink. Thanks so much for this! And glad I found it – a bit late! Yes, people are attracted to high contrast color combinations (red/green) for instance – but what really grabs us is other people and animals – with no conscious control on our part either. Human perception is animal perception. We have a 3.5 billion year old brain, which directly reflects our evolution in an extremely dynamic place – the savanna – where another animal swooping in could kill you at any instant – think lion, snake, vulture – these guys show up unannounced; so our ancestors – the ones that survived were the ones that could find and focus on another animate thing without having to think about it! Our brain is still designed for the savanna even though we may not live there; a key reason TV, video, moving images are so popular is that they recreate the dynamic, animate scenes full of faces that our brain is built to glue to. When you start doing eye-tracking experiments you gain a renewed appreciation for all the life – and death – that came before us – to give us our human abilities we rarely stop to think about. I have seen the theory that humans use the parts of the brain usually used to recognize faces in order to recognize some pieces of art. Or another way to put it is that certain details of traditional architecture like capitals use symmetries and patterns to make the detail particularly recognizeable. 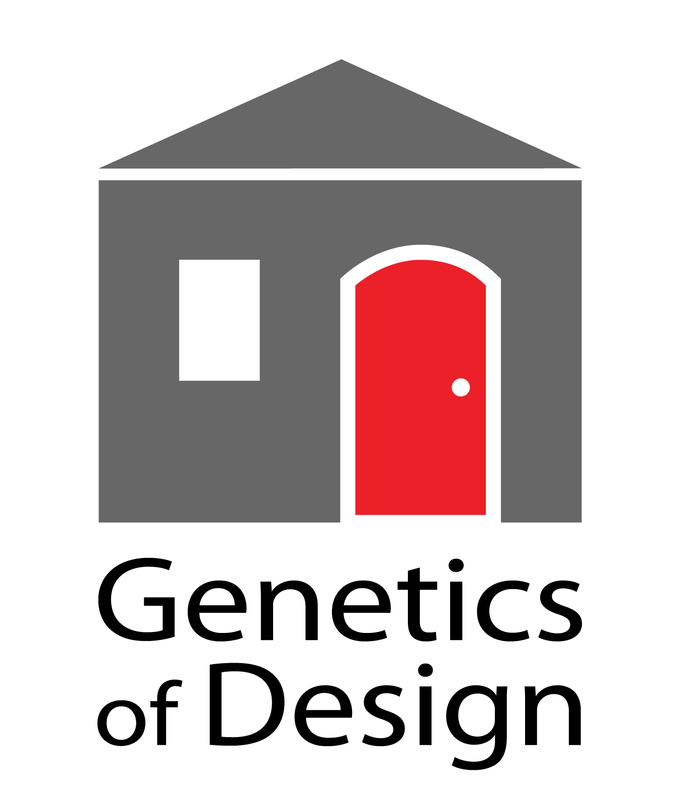 If that’s so, and it seems testable, some principles of traditional design (e.g. bilateral symmetry) might have been unconsciously adopted. They might then use the human capacity for millimeter accuracy in facial recognition in order to make, say, a facade instantly recognizeable. Is there any real science on this? Or is it just supposition? Thanks for the note, Bruce. There is a lot of science on this. You could start with Eric Kandel’s book ‘The Age of Insight,’ (2012) – written by a Nobel-prize winning neuroscientist it goes into detail about how face perception is hard-wired in us and how that connects to what we appreciate in art. In terms of architecture, you might check out Cognitive Architecture, 2015, which relates face perception to the built environment and how we attach to places (or not). The first chapter can be read online for free at the Amazon or Taylor+Francis link! Yes good questions! The human brain is hard-wired to see people, particularly faces, which can explain why so many of the heat maps glow bright red wherever they are in an image – even as shadows. We actually have a ‘blueprint’ of the face, also called a ‘figural primitive’ in our brain, on standby to get our brain to process a face fast – whenever one might show up. Think survival! Think 3.5 billion years of evolutionary history, mostly in the wild. And yes, we’re hard-wired to pick up animal ones too. In the interior shot, above, in fact, three circles glow reddest around the shadowy profiles suggesting people; the fourth fainter shadow is glowing red around the head of a small ceramic cow displayed on a table! Who knew? My sense is most people had no idea the cow was there – no matter, their subconscious did + had already checked it out! New findings in cognitive science are going to give new understandings of how art + architecture work; if you think this would be of interest to folks at RISD LMK! – I’d be happy to give a talk. What about feelings of comfort? Which image appeared to be “safer” to the subjects?